The attached sample shared parenting plan has worked well, for the benefit of the child concerned, over the past 11 years. It was registered with the FCA, in 1997 when parenting plans could be registered and had the effect of court orders. This is no longer the case. All names, dates, addresses, etc have been changed. 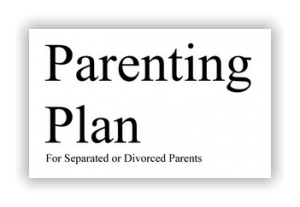 The plan covers many issues that someone preparing their own parenting plan might well consider. It is not perfect and does not cover all issues. It could have covered the issue of one parent making medical (or any) appointments that occur when the child is with the other parent and better outlined each parent’s rights to access school time, documents and placement on emergency contact lists. The halving of Christmas Day was not practical and morphed into alternating each year, with the child also being with one parent’s extended family on Boxing Day (which was a day they typically met together). Additionally, details of times spent with each parent could be defined more specifically and the word “half” not used, but defined exactly. This parenting plan ran out at the end of primary school, but has in fact continued on to Year 12 in spirit. A trigger event(s) or opporunity(ies) might have been included for review at the end of primary school and perhaps after Year 11, when children tend to be more independent and become more involved in the operation of the plan. As with other parenting plan examples and samples the benefit that can be gained is not in copying but in seeing how someone else has managed it, what issues they looked at and included and how they laid out the plan. Your task then is to tailor a plan that is appropriate to your family situation, which is realistic (can both parents and the child(ren) really manage it) and which you and the other parent understand and own. The legal situation has altered since this plan was developed, so it would be wise to check your plan with a Family Relationship Centre, family law courts, a solicitor and those who have walked this path before you (so feel free to anonymously discuss issues on this forum).